This full-size mockup shows a compact MRI scanner that could fit aboard the space station. Handheld "tricorders" from "Star Trek" remain just a science fiction fantasy for astronauts who need advanced medical care in space. But a new version of full-body scanning technology has the right size and power requirements to possibly fit aboard the International Space Station. The smaller, cheaper version of a magnetic resonance imaging (MRI) machine could provide "slice" images of astronauts' bodies to improve studies of human health in space — issues such as bone and muscle loss in low-gravity environments or the effects of deep-space radiation. Space explorers living on moon bases or traveling to Mars could also benefit from having such medical technology available during missions lasting for months or years. "I would like to build a facility-class, whole-body-sized MRI," said Gordon Sarty, acting chairman of the biomedical engineering division at the University of Saskatchewan in Canada. "Such a project would require an agreement between the ISS space agencies." A compact version of MRI medical scanners could study astronaut health aboard the space station or on future planetary bases. The compact MRI could weigh less than a ton — one-twentieth of a ton for a smaller version that scans arms and legs — and would require far less power than traditional MRI. Costs for the full-body MRI could drop from $2 million to as low as $200,000. Sarty presented his team's compact MRI technology at AIAA Space 2012, a conference organized by the American Institute of Aeronautics and Astronautics, on Sept. 13. He hopes to win funding from the Canadian Space Agency to launch the machine to the space station around 2020. MRI machines work by using radiofrequency coils to broadcast signals to the human body and receive return signals to build an image of the body's innards. Gradient coils control the machine's magnetic field to produce the precise "slice" images of certain parts of the body. 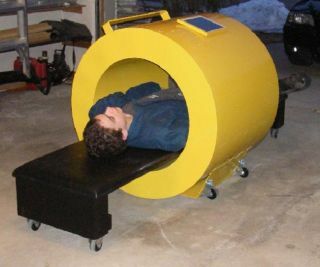 "These characteristics make it impractical and potentially dangerous to take a conventional MRI into space," Sarty told InnovationNewsDaily. Compact MRI uses two different technologies to get around such problems. First, it uses a permanent Halbach magnet that is lighter than the superconducting magnet and does not create stray magnetic fields outside the magnet. Second, the compact MRI eliminates the power-hungry gradient coils by using Transmit Array Spatial Encoding (TRASE) that encodes images through the radiofrequency coil alone. The smaller MRI technology has many uses far beyond space — it could improve overall medical care on Earth by making the cheaper machines available around the world. Its smaller size could also lead to easier use of MRIs in battlefield hospitals or distant parts of the world with limited space and power. Many of the new technology's pieces have already fallen into place. Halbach magnets have shown they can create the required magnetic fields, and TRASE Coils have successfully created images inside a conventional MRI machine with the gradient coil fields switched off. Sarty's team has also created a full-size mock-up of the compact MRI. Several of the space conference attendees urged Sarty to develop the Earth applications first before pushing use of the compact MRI in space. But Sarty hopes the Canadian Space Agency can take enough interest to fully fund the concept for testing in a space environment. "Eventually someone will break a bone in space," Sarty said. "We have no idea if that bone will heal." This story was provided by TechNewsDaily, a sister site to SPACE.com. You can follow TechNewsDaily Senior Writer Jeremy Hsu on Twitter @ScienceHsu.